On November 23, 2018, two major things happened. While Americans were busy spending an estimated $23 billion on Black Friday deals, the United States government quietly released a dire warning: climate change is happening now, it’s already damaging our economy, our health, and our environment, and will likely cost the country hundreds of thousands of lives and hundreds of billions of dollars in damages. Cities play a critical role in the human-driven climate crisis: not only are cities significant emitters of climate pollution, cities are where the rubber meets the road in terms of the impacts of climate change. Over half of the planet’s population – approximately 4.2 billion people – lives in cities (a number expected to rise by more than 2.5 billion by 2050) and urban areas currently account for 70% of both global energy use and GHG emissions. This means the majority of the world’s population is already exposed to climate impacts like flooding from sea-level rise, extreme heat which is exacerbated in densely built environments (heat island effect), harmful air pollution from industrial development and concentrated transportation emissions, farmland degradation that affects the food cities depend on, and to all the residual physical and mental health outcomes that go hand in hand with a changing climate. Furthermore, frontline communities of color who have historically contributed the least to climate change are likely to be the most affected. Cities are also hubs of innovation that are already shaping climate change solutions. When Donald Trump pulled out of the internationally adopted Paris Agreement, 280 American cities and counties signed the “We Are Still In” pledge, committing to climate action despite Trump’s belief that climate change is a hoax perpetrated by the Chinese. Major cities like New York, San Francisco, and Seattle are leading the charge in aggressive climate action with billion dollar-building retrofits for energy efficiency and major investments in renewables, but smaller cities like Boulder, Rochester, and Detroit are also coming up with innovative climate solutions often with frontline communities at the forefront. In 2016, Mayor Jorge Elorza committed Providence to becoming a carbon neutral city by 2050, and Providence has already begun to wean itself from its dependence upon harmful GHGs such as carbon dioxide (CO2), Methane (CH4), or Nitrous Oxide (N20). These gases – especially CO2 – enter our environment when we burn dirty, fossil-fuel based energy to heat and cool our buildings, or to fuel the thousands of vehicles that travel through our city every day. To achieve this ambitious goal, the public and private sectors, along with the entire Providence community, must work together to tackle the root causes of this crisis and disrupt “Business as Usual” attitudes that continue to contribute to what has been called the greatest human health threat of the 21st century. The work may be just beginning, but the City of Providence is already taking steps to end our dependency on harmful fossil fuels and start the process of becoming carbon free by 2050. 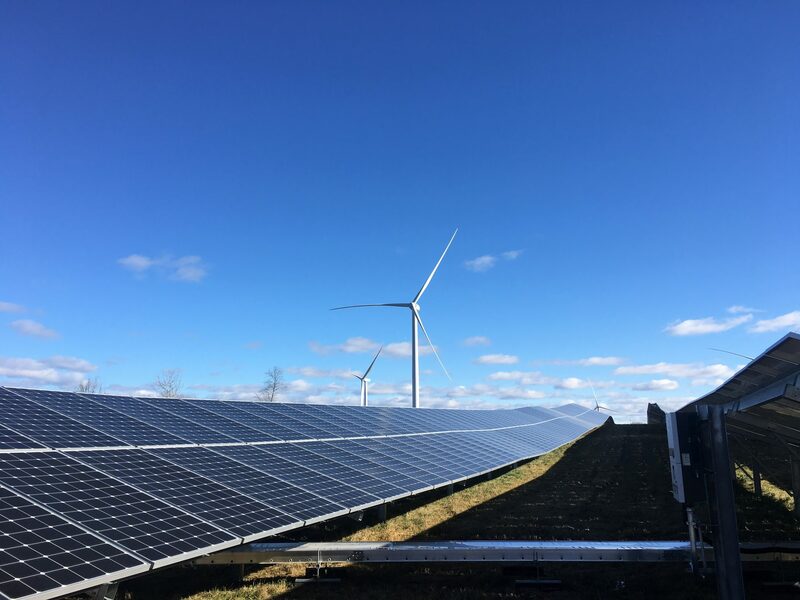 On Tuesday, December 4th, Southern Sky Renewable Energy RI marked the completion of a 3.9 MW solar array in Johnston – built on a former landfill – which will power over half of Providence’s municipal buildings with clean, local solar electricity. Not only is this better for the environment and our health, but it will also save taxpayer dollars, diversify our energy supply and support local labor. According to Southern Sky, the renewable energy produced by the array will yield environmental benefits equivalent to taking 770 vehicles off the road while powering 538 households annually. The Johnston solar array is just a small part of Providence’s renewable energy portfolio. Another 29 MW facility is currently under construction in Cranston and these two sites combined will offset approximately 60% of the City’s electricity needs. Clean energy sourced from renewables is just one part of Providence’s upcoming Climate Action Plan. For Providence – and for any city engaging in climate action – it’s no longer just about becoming carbon neutral or setting emissions targets, it’s about leveraging this opportunity to create a thriving, resilient, and equitable city in the face of global climate crisis. Want to know more about the City’s climate strategy as it’s being developed? Keep your eyes on @SustainPVD and SustainPVD.com for continued coverage on the City’s climate action efforts. NEXT TIME: Breaking Down “Business as Usual” in Providence – how much greenhouse gas does Providence emit and where do the City’s emissions come from?